Fashion month is a time when we are reunited with our favourite street style stars, such as Caroline Issa, Leandra Medine and Olivia Palermo, but it is also the chance to discover new editors or bloggers with style worth shouting about. It is only February, but Jan-Michael Quammie has already emerged as one of our favourite newcomers on the street style scene in 2017 and was our best-dressed girl in New York. She is the fashion director of InStyle Germany and previously worked as a senior stylist at MyTheresa and for Net-a-Porter.com in Shanghai. Jan-Michael's style is eclectic and playful, as she often mixes unlikely colours, textures and prints—a combination that makes her the perfect subject for a crowd of street style photographers outside the shows. She might be wearing the same Gucci loafers as the rest of the front row, but her styling of said shoes will be entirely different. And no two Jan-Michael Quammie outfits are the same either, as instead of relying on the same formulas she consistently shakes things up going from masculine tailoring to a sporty tracksuit in a flash. And yes, before you ask, she is on Instagram. Scroll through the gallery below to see Jan-Michael Quammie's best street style looks and the shop her key pieces. Style Notes: At New York Fashion Week, Quammie showed that it pays to clash unlikely prints and fabrics, in her orange Jil Sander leather trench coat, Bally snakeskin-print boots and emerald-green Marc Cross bag. Style Notes: Jan-Michael is a fan of the sporty trend, and she often pairs classic sportswear pieces with high-end fashion pieces. 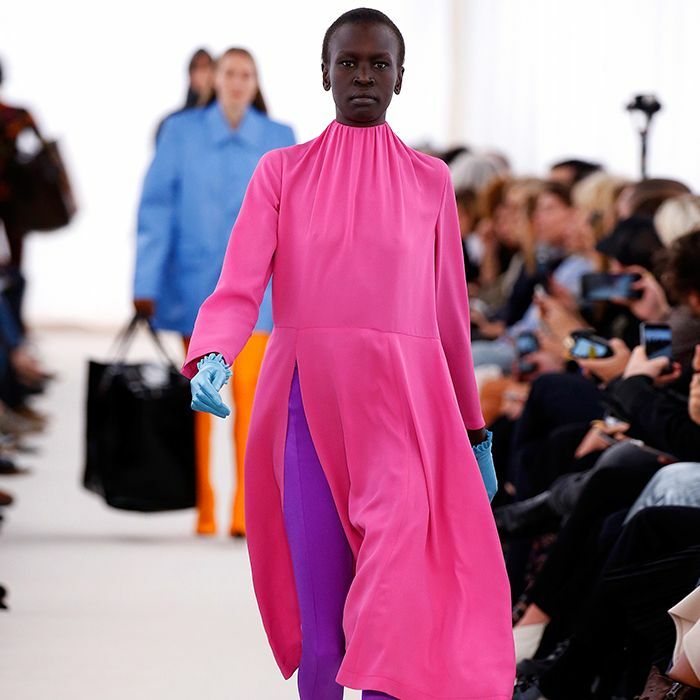 At fashion week, she wore jogging bottoms with a blue-and-white striped Ralph Lauren shirt half-tucked into her waistband and bright pink Céline glove shoes. Style Notes: Jan-Michael has a thing for smart tailoring pieces, such as these green striped trousers paired with a heritage check blazer and her Marc Cross structured handbag. Once again, she clashes unlikely prints, pairing her pinstripe trousers with snakeskin boots. Style Notes: Jan-Michael is a fashion magpie and is often drawn towards glittery, shiny and sequin fabrics, such as this sleeved lilac high-shine dress and these blue glittery socks, which she paired with furry sliders. Once again she embraces the unlikely mix of trends, colours and textures. Style Notes: Green is Jan-Michael's go-to colour, and she often doubles up on this shade such as with this grassy green-and-black striped furry Max Mara jumper and coordinating green handbag. Style Notes: The fashion director has a keen eye for accessories and has embraced the statement earring trend at the shows so far this season, wearing a pair almost as large as her handbag. Style Notes: This is the perfect example of how to style one of this season's biggest trends: mix-and-match styling. Jan-Michael proves that you shouldn't just experiment with prints, but with textures too. Style Notes: Jan-Michael loves playing with proportions, such as with this oversized androgynous navy coat countered with her teeny tiny handbag. Style Notes: As you'll know by now, Jan-Michael is all about the accessories, and statement novelty sunglasses are one of her fashion week essentials, such as these by Andy Wolf. Style Notes: Jan-Michael is, like most street style stars, obsessed with Gucci, and she often wears the trainers and loafers, which she always pairs with an ankle sock. An oversize trench coat is a Jan-Michael essential buy. She often wears Gucci loafers in bright colours or with plenty of embellishment. Mix this colourful striped jumper with clashing prints for a Quammie-approved look. She is a fan of the vinyl trend and would pair these with a contrasting texture. Remember to pair these with a statement ankle sock. Tracksuit trousers are also a Jan-Michael must-have. We love the vibrant yellow shade of this Proenza jumper. These would look perfect with a pair of Gucci loafers. She often takes a break from heels during fashion week wearing comfy trainers. To style like Jan-Michael tuck only one side of this shirt into your trousers. To re-create her more sporty looks. For more style inspiration, meet the Net-a-Porter buyer the street style photographers are obsessing over this year.